If you are going to break into a crowded category like energy shots, you need a plan. For Jack McNamara, the founder and CEO of DrinkTru, the coming weeks and months will test if his plan to disrupt the space bears fruit. Having built the Boston-based company around a single SKU, McNamara is aiming to guide DrinkTru through a critical growth stage by expanding its product lineup into on-trend functional categories and securing new financing and advisors. DrinkTru’s new product lineup reflects a handful of the popular functional properties driving the beverage market today. Aimed at the fitness demographic, TruPower contains similar caffeine content (200 mg) and nutritional profile (branch chain amino acids, beta alanine) as “performance energy” products such as Bang and C4. 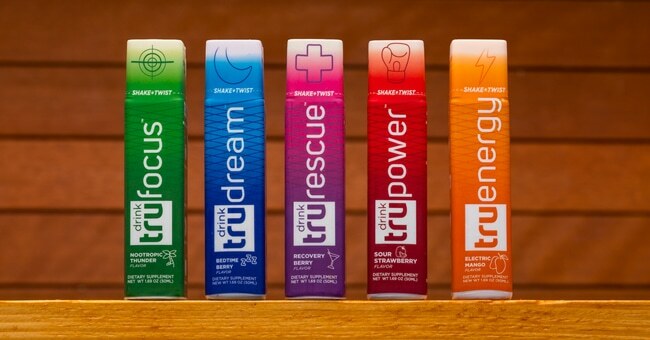 Meanwhile, TruRescue provides all natural “recovery,” and TruDream is the latest entrant to the growing sleep aid category. Finally, the brand is launching TruBreeze +Hemp, which contains 10 mg of full spectrum hemp per 1.69 oz. bottle. Despite the hyperbolic postings, the journey thus far has been slow but steady. Until now, the company was exclusively focused on TruEnergy, which features natural caffeine (100 mg), vitamins, electrolytes, antioxidants, and coconut water in a 1.69 oz. bottle. The product is available in approximately 700 stores, including Hyvee and Massachusetts-based grocery chain Roche Bros. The company leveraged acceptance into a pilot program called Startup 52 into a spot in the FoodX accelerator program in 2017, which resulted in McNamara securing a $25,000 investment from New Jersey-based SOS Ventures. During that time, McNamara said he purposefully cast a wide net In searching for investors and advisors. After pitching the brand over a period of several years to everyone from college friends to real estate developers and VC firms, he managed to assemble a diverse patchwork of investors that landed the company $567,000 in an early funding round. SOS Ventures is now the second largest stakeholder, with around 10 percent of the company. Other backers include former NHL player David McIntyre and current player Chris Wagner, as well as Rob Soni, an early investor in brands like Bai and Sir Kensington’s. Despite the boost from new funding, Tru still faces a hegemonic challenge in 5-Hour Energy, which represents over 90 percent of the shot category. Along with that brand, consumers are seeing expanded options when it comes to functional shots of all types. Coffee shot maker FORTO has emerged as a disruptive brand in the space, thanks in part to support from Keurig Dr Pepper (KDP). Meanwhile, traditionally moribund segments of the shot category — such as hangover recovery and sleep products — have, for different reasons, enjoyed an uptick in activity in recent months. Even with the core TruEnergy line only beginning to develop a presence in retail, McNamara said the need to create a strong differentiator from its competition helped fuel his decision to revamp the line with multiple new SKUs. 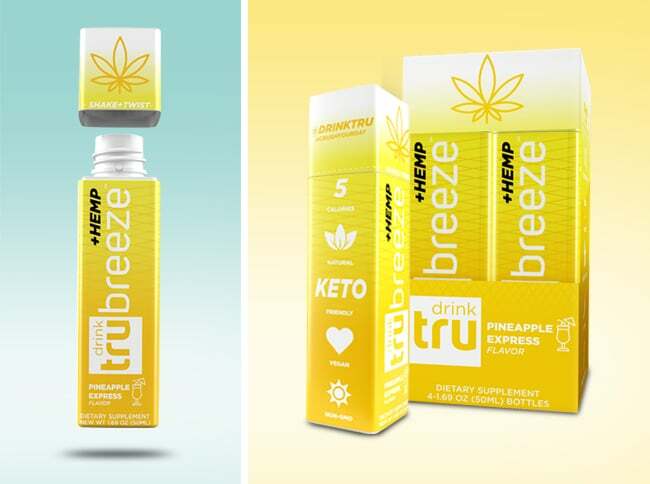 In stepping into the exploding hemp and CBD market with TruBreeze +Hemp, available in Pineapple Express flavor, McNamara said establishing strong and consistent record of product efficacy was key for his brand. Acknowledging the difficulty in breaking through the noise, he said the company purchased “literally the most expensive [hemp] we could find” — a nano-encapsulated full spectrum hemp paste that cost over $14,000 for 0.5 kg. The company then worked with a secondary processor to produce the actual product. TruBreeze +Hemp will carry a premium price point of $3.99 at retail, compared to $2.49 for the brand’s other products. McNamara said he wants to keep Tru’s offerings at an accessible price, but that positioning the hemp SKU also brought other considerations. For the short-term, however, Tru is working to take its expanded lineup deeper into the areas in which it has connected with consumers. According to purchasing data, this means primarily women aged 25-35 in urban centers; McNamara said the brand’s marketing strategy will be recalibrated to target that demographic. As part of the investment, a pair of experienced hands — John Wetzonis, senior VP of sales at Polar, and Scott Moffitt, president of coffee creamers and beverages at Danone — have joined the company’s board. McNamara also hired his first employee, who is handling operations, financing and manufacturing. Looking further ahead, McNamara also said Tru has plans to release full-sized ready-to-drink versions of its shots line. He said the company produced a prototype of the canned product, but has since put the project on the back burner to focus on supporting the launch of the new shots.